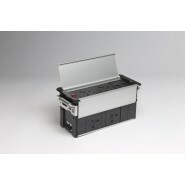 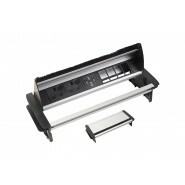 The Horizontal In Desk Power Dock is a letterbox style unit which is fitted into the desk. 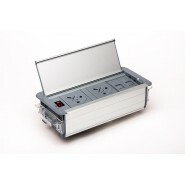 The unit has an aluminium finish, and a short lead with a 3 pole GST connector, meaning the length of power lead can be customised using a Start lead. 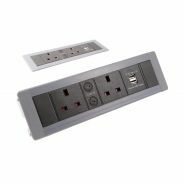 Each data cut-out lets the customer the unit, Data, Voice, HDMI, VGA and Audio options, you can also terminate your own data straight into the unit. 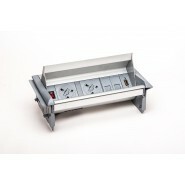 A brush strip along the front of the unit means that the unit can be folded down even when in used, letting the cables come up through the desk..